Etched, sandblasted, textured and decorative glass designs have many advantages. They give privacy but still provide light into a room. They can be customized for any look you desire. However, they can also be expensive. How to achieve these effects and still remain within budget? It’s possible, with 3M™ Fasara™ Glass Finishes and with 3M™ Crystal Window Finishes. 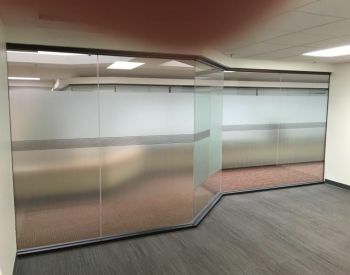 Aesthetics: Our decorative glass and window films transform plain glass, capturing the look of cut or texturized glass to a great degree at a fraction of the price. Flexible: Fasara™ Glass Finishes allow you to tailor the amount of privacy a space possesses. Use Fasara Glass Finishes to create serene "rice paper wall" effects, or die-cut or layer the films to create exciting, customized effects. Easy application: 3M expertise in adhesives ensures you of accurate, beautiful and durable application to a variety of glass substrates. Materials: Constructed from flexible and durable polyester, ensuring longevity of the application. Where you should use Fasara™ Glass Finishes.